Photographs of birds from Montana and western North America. 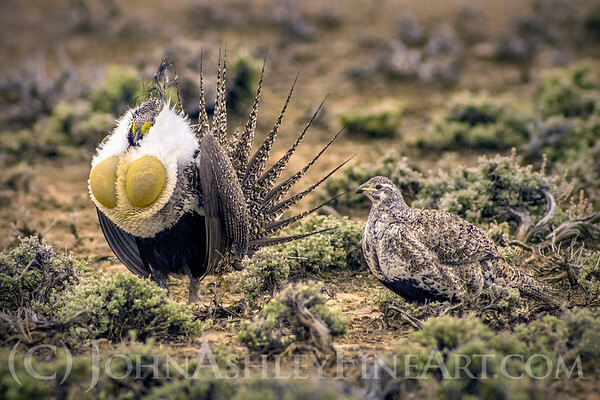 A male sage grouse puffs up his genetic vigor for the discerning eye of a nearby hen. This native species is in decline and is listed as a Montana "Species of Concern." 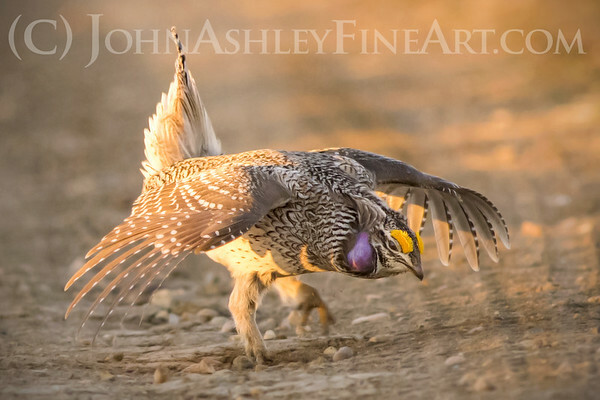 A male sharp-tailed grouse struts his stuff at dawn on the Charlie Russell National Wildlife Refuge, in eastern Montana. This native bird is listed as a "Species of Concern" in Montana. 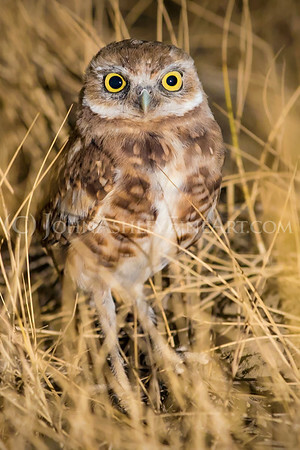 With its short tail and long legs, the burrowing owl is a specialist that breeds on the prairies of central and eastern Montana. The Montana population has seen a slight decline while the owls practically disappeared just across the border in Canada, due to habitat loss and insecticide use related to commercial farming. 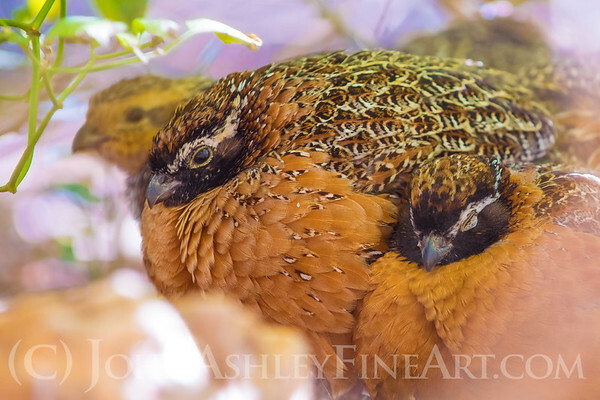 Endangered masked bobwhite males wear russet breast feathers and a white eye line over a black mask. They were discovered in the southwestern U.S. by American biologists in the early 1900's, but they quickly disappeared from their desert grassland habitat due to fire suppression and overgrazing by introduced livestock. A remnant population discovered in Mexico in the 1950's was used to start several captive breeding populations. Currently, all known masked bobwhite north of the border survive only in captivity, none in the wild. 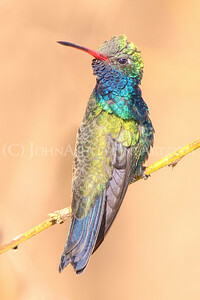 The feathers of a male broad-billed hummingbird refract sunlight into a painter's pallet of colors. 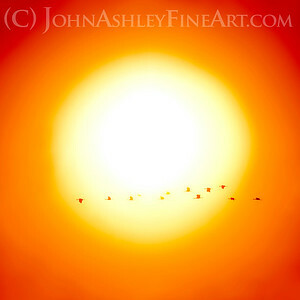 A winter flock of Sandhill Cranes heads out just after sunrise to feed in the agricultural fields of southern Arizona. Behind the lens Phoenix is the mythical bird of rebirth and renewal from ancient Egyptian, Greek, Roman and Chinese cultures. It is a stork-like bird with glorious feathers of gold and red. According to Greek legend, the Greek sun-god Helios stops his chariot (the sun) at dawn to listen to its beautiful song. Once every 500 years, the Phoenix builds a nest of twigs which it then sets afire. Bird and nest burn furiously and, from their ashes, a new Phoenix arises to live for another 500 years. The capital of Arizona was so named because it was built on the ruins of an extensive Hohokam civilization that had flourished in that location centuries earlier. 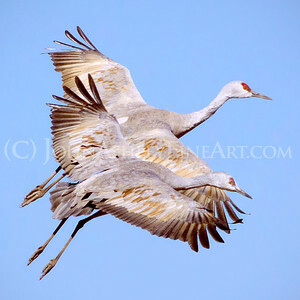 Sandhill Cranes pair for live, so you'll often see them flying in pairs or in small family groups. Behind the lens. 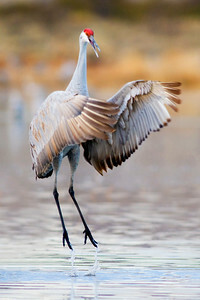 While flycatchers are hard to photograph in flight, Sandhill Cranes are big birds that slowly glide to a graceful landing. For me, watching groups of cranes arrive is much more spectacular than human ballet. Sandhill cranes often jump up and down when around each other — a form of communication that looks vaguely familiar to us. 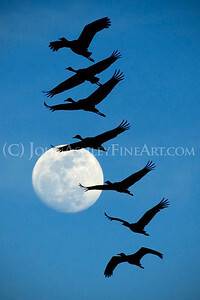 After sunset, the moon watches while a flock of Sandhill Cranes fly towards their evening roost. Behind the lens. I visualized this image for several years before getting a chance to capture it. When we finally arrived on location, it still took me three evenings to to get the moon, clouds and cranes to cooperate. 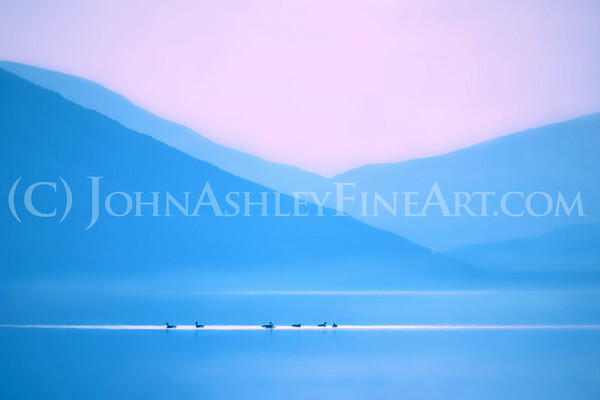 Canada Geese gather together in the peaceful, pre-dawn light on Lake McDonald, in Glacier National Park, Montana. 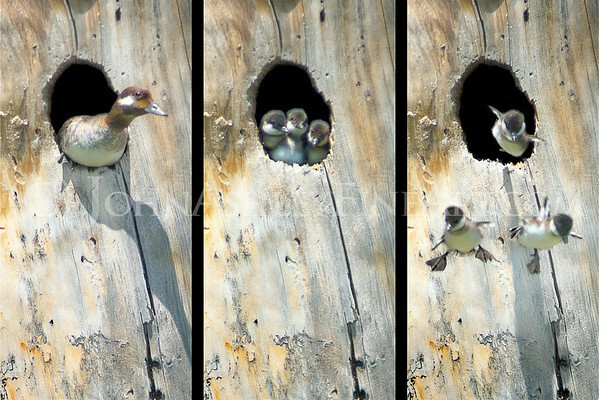 Bufflehead chicks make a leap of faith and follow mom from their nest cavity to the lakeshore, about 40’ down and 100’ away. Photographed on a small lake in western Montana. ("Leap" note cards available here.) Behind the lens. "Leap of Faith" is one of our most popular photographs. People walking through art shows suddenly stop, point at the photo, and laugh out loud. What better "gift" can we give total strangers than the gift of laughter? I like to believe that people who hang this photograph in their home will get a chuckle every day, no matter what else happens to them that day. We were walking our dogs on a favorite trail when Tracy first spotted the hen peeking out of the nest cavity, about 40' up in a twisted larch snag. Tracy took the dogs home, and I returned with my camera and set up my tripod as far away as I could with my largest telephoto lens -- and waited. Bufflehead chicks feed themselves, so as soon as all of the eggs hatch, mom must lead them from the nest to the lake. While I hid nearby, mom kept looking out of the hole every few minutes for a couple of hours. Finally, she dropped straight down to the bottom of the tree and then sat there silently for several more minutes. When she let out one soft "cluck," the chicks suddenly made their first appearance in the hole and immediately started jumping down -- one, two and three at a time -- to join mom. There were seven chicks all together, and it took less than 30 seconds for all of them to leave their nest and "fly" down to mom. Actually, their feet are bigger than their wings, and it's more of a controlled crash than a first flight. Once regrouped at the base of the tree, mom led her family on a 100-yard hike through the brush and fallen trees to reach the safety of the lake. All's well that ends well. The brilliant red plumage worn by the male Vermilion Flycatcher (Pyrocephalus rubinus) is the source of his common name, "The Flying Tomato." Behind the lens. Typically, the smaller the bird the faster it flits about. 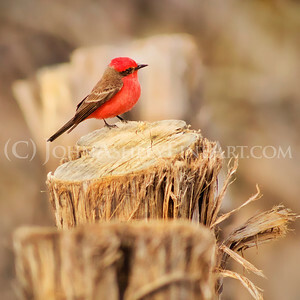 Vermilion Flycatchers are small birds that sit on a perch and watch for flying insects. They never sit for long, and they are equally likely to launch in any direction. Since I don't use autofocus lenses, my efforts at catching a sharp, well-timed flight image of the "Flying Tomato" are, so far, fruitless. 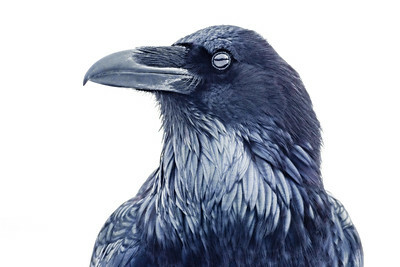 The handsome Raven is intelligent, curious and playful. 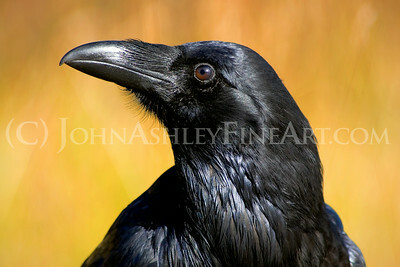 ("Curious Raven" note cards available here.) Behind the lens. Whenever winter lands hard across Montana, I think of Ravens. Wind, snow -- Ravens. Two or three serious blizzards have lured me into the mountains when I probably should have stayed home. But each time I ventured into the crushing cold, I found Ravens at play. Ravens making great looping, roller coaster flights into gale-force winds. Flights that lacked any apparent direction or purpose, flights that just looked fun. I trudged home half-numb but full of respect. Ravens provided the inspiration for many Native American stories, and now they are acknowledged as one of the most intelligent and wide-ranging of all bird species. They are year-round residents here in the western half of Montana. Unlike Crows, which are smaller and often live in flocks in towns, Ravens tend to live in monogamous pairs in the wild, undeveloped areas that remain. Displays of their ingenuity have been noted often. Ravens have been seen defending their nest by dropping stones on approaching people, and passing food through a zoo cage to feed a hungry vulture in freezing weather. The association between Ravens and wolves is also well-documented. Ravens are scavengers, but they are unable to tear open a fresh carcass. So they learned to follow wolves (and wolf tracks) and scavenge their kills. Calling Ravens are also hought to alert wolves to the freshly deceased. Once torn open by wolves, the carcass becomes accessible to the Ravens. But it gets a little more complex. Ravens have also learned to make seasonally-appropriate responses to howling wolves. Ravens generally ignore wolf howls between April and September, when wolves tend to hunt smaller items, and most howling occurs near the den site. But in winter, Ravens actively follow the wild chorus of howling wolves. In winter, wolves tend to hunt in groups and kill larger prey, which can take several days to completely consume. This change in wolf hunting tactics gives Ravens ample opportunities to scavenge meals. 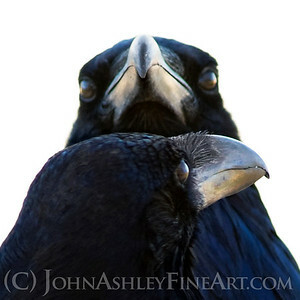 Mated for life, Ravens are an affectionate couple. They spend lots of time perched shoulder to shoulder, and they often perform mutual preening which reinforces their pair bond. Behind the lens. Yes, these are wild, free-ranging birds. Photographing glossy-black feathers in deep-deep shade was challenging, and I had to drop to a shutter speed slower than I really wanted. As a result, this gets a little blurry when blown up large, so I'm keeping the available print sizes on the small side. This is a photograph of a Raven in snow that I edited to look like something between a photo and an etching. There's just something about their glossy throat feathers, not to mention their intelligence, that I can't get enough of. The golden sunset silhouettes a group of Black-necked Stilts feeding in the shallow waters. Behind the lens. This is one of the rare, non-Montana photographs that I'm posting. 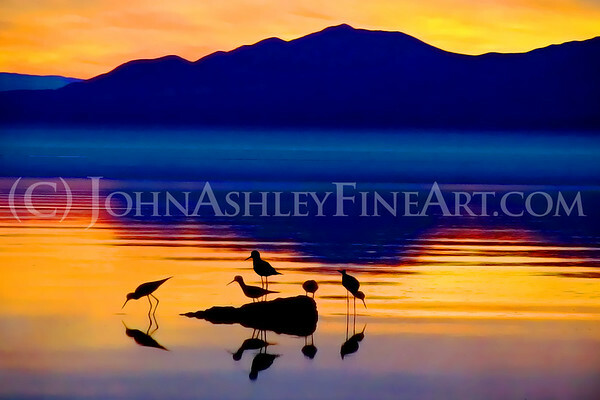 We experienced this dazzling sunset on the Salton Sea, in southern California. The only good part about having air quality issues is that you get really intense sunsets. A Bald Eagle catches a fish from a small Montana lake. The progression is shown in 0.2 second intervals, and from beginning to end is 0.8 (eight tenths) of a second. (Note cards available here.) Behind the lens. As a biologist, I spent years monitoring Bald Eagles in Glacier National Park. I've seen Eagles catch fish and ducks many times, but it always happens so fast that I can never tell exactly how they do it. So I imagined this sequential photograph for a long time, in the back of my mind, before I was actually able to document the event with a camera. Like most birds, Eagles fly with their feet and legs held tight to the body for aerodynamic reasons. As they stoop on a prey item, the legs rotate forward and the talons extend, hitting the fish with force and locking down. As they start to fly away, they'll often turn the fish around head-first, again, for aerodynamic reasons. It's a beautiful sequence that's been perfected by countless generations of Bald Eagles -- and it happens in the blink of an eye. 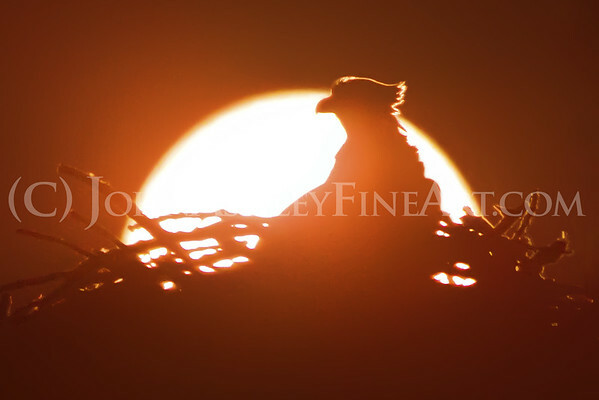 A Montana osprey named "Harriet" watches and waits from her nest while the sun sets behind her. Harriet lost her mate late one summer, and her patience finally paid off late the next summer when a new male arrived who Harriet found worthy. 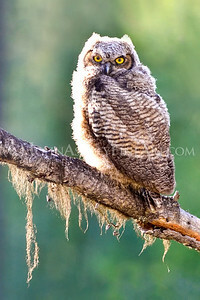 A juvenile great-horned owl tries hard to stay awake while perched in a summer in a sunbeam. 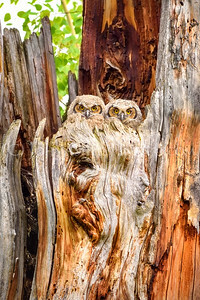 A pair of curious great-horned owls peek over the edge of their nest in a broken-top larch snag. 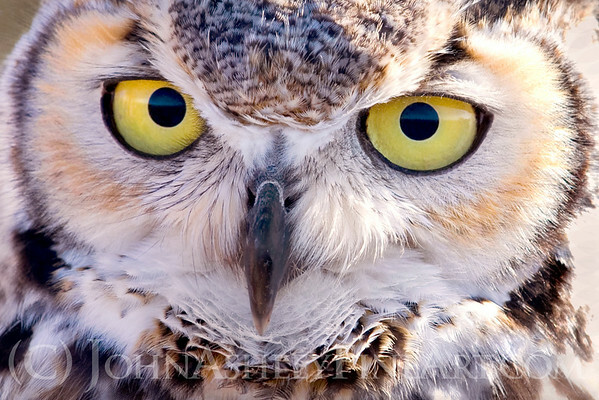 With the forward-facing eyes of a raptor, a Great Horned Owl portrait gives the impression of intense concentration. Behind the lens. This is a trained bird, photographed while sitting on the trainer's glove. This face is a great example of something that has always fascinated me -- how many different shapes and functions that feathers can take on in a single bird. How many different feather shapes can you see? 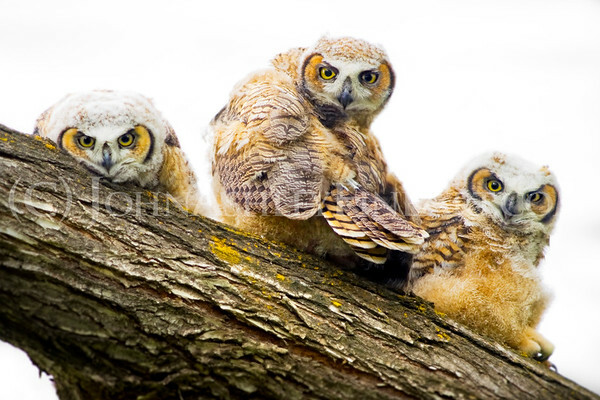 A trio of Great Horned Owlets watches with intense curiousity as a big, new world unfolds below their family tree. They're about nine weeks old and just starting to think about flying. 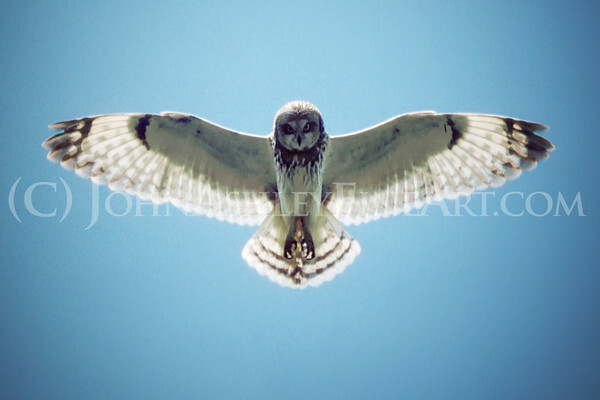 A Short-eared Owl glides across a Montana grassland. Behind the lens. I was helping my good friend, Kuenhi, with the fieldwork for his master's degree on Ring-necked Pheasants, at a USF&WS Wildlife Refuge here in Montana. We were slowly walking the fields, parting the grass with long sticks to look for pheasant nests. Once found, Kuenhi would take all manner of measurements for one egg, and then we would cover the nest and move on as quickly as possible. Short-eared Owls are also ground nesters, and we must have passed close to her nest as she hovered above us for a few moments. But we moved on, and she went back to hunting. 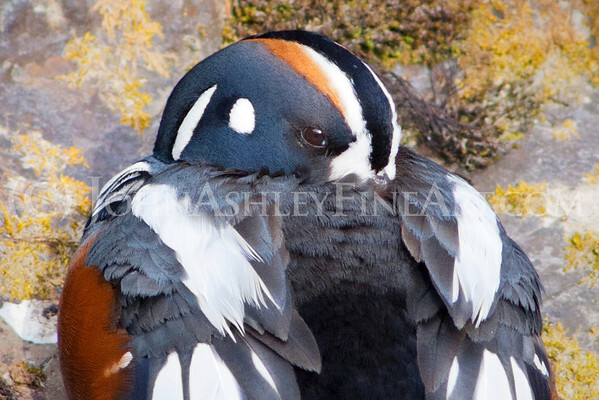 A male Harlequin Duck keeps one eye open while napping on a moss and lichen-covered boulder. Behind the lens. I actually made this image three camera bodies ago, and I finally got around to editing it about four years after making it.